The most portable DJ set-up yet? A well-built controller that's perfect for a compact and portable DJ set-up with Traktor DJ software. Works with Traktor DJ on iOS. Well built and extremely portable. Good sound quality. Some features work differently on different platforms. Native Instruments have been re-imagining the DJ set-up in recent years with their Traktor software and hardware range. 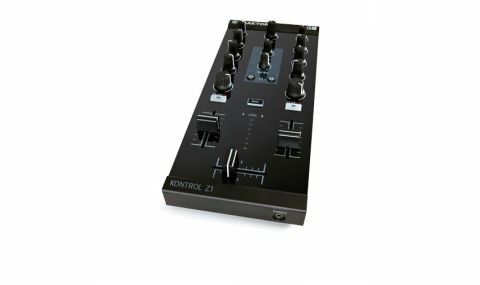 The Z1 is the same size and shape as their popular F1 and X1 Kontrollers, but the layout is that of a traditional two-channel DJ mixer, complete with a built-in audio interface for monitoring. This is their first controller designed for use with the new Traktor DJ software on a recent Apple iPod, iPad or iPhone, allowing for a very portable set-up. "The construction of the Z1 is as solid as previous models, with a sturdy plastic case and controls"
The construction of the Z1 is as solid as previous models, with a sturdy plastic case and controls. The channel-faders have the right amount of resistance for long smooth mixes and the crossfader is nice and light for faster moves. Backlit buttons and (pre fader) volume meters are bright and responsive. Cables are included for connection to a computer or 30-pin Apple iOS device. Owners of the newest Apple units will have to budget for a Lightning to 30-pin adapter as well as the Traktor DJ software. A power supply is also in the box and required for use with iOS devices. This limits the portability of the system, but it charges the iOS device during use. A downloadable copy of Traktor LE completes the package. The features offered by the Z1 complement Traktor DJ software on an iPad very well. The iPad screen is still used for playing tracks and FX control, leaving the Z1 perfectly suited to EQ, mixing and monitoring. When used with a desktop computer the Z1 combines well with other models from the range to create a modular system. In use, the Z1 feels just like a regular DJ mixer. It has no external audio inputs however - all sound comes in via USB. Sound quality is good and the main audio and headphone outputs are nice and loud. "A Z1 paired with an iPad or laptop makes for a powerful but extremely portable combination"
There are a few hidden features: when using the Z1 with Traktor DJ the filter knobs can be switched to control the FX section. Similarly on the desktop version of Traktor, the cue buttons double as play/pause buttons when pressed with the mode button. Strangely, these features do not work the same on both platforms, but this may only be a software update away. There is also a MIDI mode to enable more advanced mapping with software on a computer (but not for iOS devices). A Z1 paired with an iPad or laptop makes for a powerful but extremely portable combination. Advanced DJ's may want to add other devices for extra control, but could still use the Z1 when travelling light. While more controls would be nice, it would add to the cost and size of the unit. Overall, the Z1 works very well at what it does.